First off, thank you so much everyone for your lovely comments on my umbrella dress! It is finished, but I have not started the etsy one as of yet. I have two unfinished projects that have been sitting around in bags that I would like to get finished first! I have not finished this yet, but here’s the project of the moment. This is a crinkle silk charmeuse which I found in the Los Angeles Fabric District on sale for only $6 a yard! I was in the midst of creating my wedding dress last year, but I could not resist a yard and a half of this luscious fabric. The maker is quite impressive, too. It was designed by Nanette Lepore! 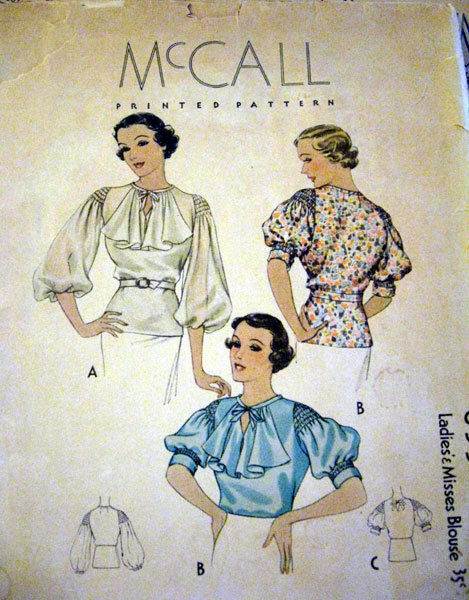 I have had this blouse pattern in my “to make” list for quite a long while, but all the gathering and hemming kept me putting it off. 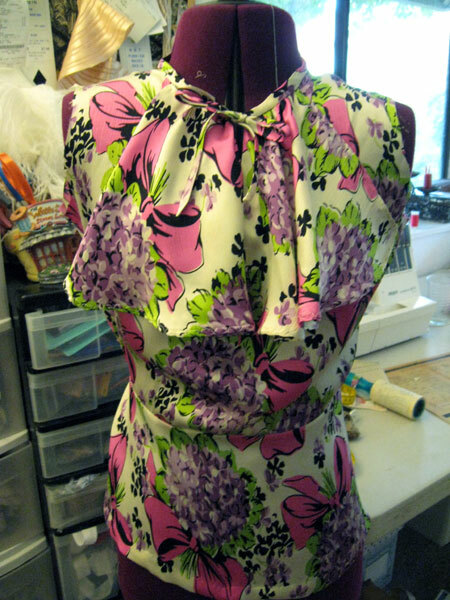 Finally this fabric has inspired me to make it up! I’m making the short sleeve version. The fabric is not yellow tinged, as it is in photos, but is a diamond white. It will go well with the plain black wool skirt I made last year, and hopefully will be part of my trip wardrobe for England this year. I even have a black hat that matches perfectly but I have to repair the weave of the straw before it can be worn. « >Tut, Tut! It looks like rain! >i wish my town had a “garment district” that would be FABULOUS! >That print and that blouse=DARLING! >A worthy pattern for such gorgeous fabric. Beautiful!